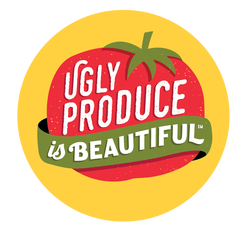 News - Ugly Produce is Beautiful! April 26, 2018 Sarah Phillips: "I was always intrigued about mixing and matching patterns and designs." From author to philanthropist, Sarah Phillips has done all she can in order to help our planet and its disastrous capabilities. Her visions are clear and her intentions are sincere. Find out more about Sarah! ​Who is Sarah Phillips? She is a Honorary PH.D graduate, CEO/Founder of Ugly Produce Is Beautiful and a National Geographic Award Winning photographer. She is a 2 time author and major social media influencer! Being one of the first to take hold of the power house influencing media of Instagram, she created the account @food and today has 500,000+ followers. With such a widely followed platform and passion for food, she made it her goal to create awareness about an often forgotten and little talked about subject. Ugly Produce Is Beautiful has become a lifelong project about the waste that goes into 'picking' what fruits and vegetables are sold according to their aesthetics. Each year, two billion kilos of products in the U.S. are left to rot on dump sites because they are rejected as they seem to be "imperfect" or "deformed" although their quality and freshness are perfect. However, they are deemed "ugly"! This is how @UglyProduceIsBeautiful was created. We gained quite the interest in the subject, since she has also grown a large following on her awareness page. She assembles these "ugly" produce items into creative patterns and photographs them to show how beautiful they really are. We therefore had some questions for Sarah Phillips! March 21, 2018 New Yorker Sarah Phillips combines ethics and artistry to create beautiful photographs of produce.” Startled by this maddening observation (of food waste), New Yorker Sarah Phillips founded the project "Ugly Produce is Beautiful" to denounce this situation she finds absurd. ​As a photographer, she had the bright idea to restore the credentials of all these forgotten products. In a series of photos that are as creative as they are aesthetic, the artist stages the fruits and vegetables that have not been able to fill the beauty standards of the agricultural-food industry. A beautiful project, so don’t hesitate to appreciate the artistry. March 14, 2018 L'infodurable Fr (Online media company in Paris, France, specialized on issues in relation to sustainable development) Many non-standard fruits and vegetables are rejected by conventional distribution channels. An American entrepreneur publishes a series of photographs to raise public awareness of this waste. Too big, too small, too weird or quirky. Because of their appearance, some fruits and vegetables are rejected by the conventional distribution circuit. An American, Sarah Phillips, wanted to restore the image of these products "ugly" to fight against food waste , via a series of photographs "Ugly Produce is Beautiful", published on Instagram . This publication is part of a broader awareness campaign launched upstream. ​The organization says that about 40% of fruits and vegetables produced in the United States would be wasted because of their appearance. In France, one out of ten fruits and vegetables is considered " ugly ", so downgraded. Mainly involved, the criteria set by some of the large retailers, or even some standards imposed by European regulations . ​Tomato not quite red, pepper deformed, apple considered smaller than the standard size ... With its project "Ugly Produce is Beautiful", the American photographer Sarah Phillips sublimates the fruits and vegetables "ugly" to raise awareness of waste food. ...​On the Instagram account of the project , the artist regularly posts impressive still lifes made from these defective products, in order to show all the beauty. Browned bananas, dented avocados, cabbage with irregular leaves ... The whole is shot in the natural light, sublimating the simplicity of these products stupidly set aside. In addition to this photographic project, Sarah Phillips has created Crafty Baking ("ingenious cooking" in French), a site of tips to store and make the best use of perishable fruits and vegetables, and thus minimize waste. To keep in mind during the next visit to the supermarket: this potato with atypical forms will have exactly the same taste as a potato called "normal". Twenty to 40 percent of the fruits and vegetables grown in America never leave the farm because they don’t meet grocery store standards. This results in billions of pounds of wasted produce every year (1). Sarah Phillips is the founder and CEO of Ugly Produce is Beautiful, an educational campaign to change the public perception of what qualifies as “good” produce. I interviewed Sarah about living through the food revolution in America, the origins of our food waste problem, and how Ugly Produce is Beautiful is working to be a catalyst for sustainable change in the food system. Autumn, 2017 Edible DelMarva featured a Sarah Phillips photograph on the cover of their Food Waste Issue. Part of the Edible Magazines. ​Americans are throwing out the equivalent of $165 billion each year from farm to fork. That's a huge chunk of change! Ugly produce is celebrated in all its vibrant colors and beautiful formations in this account. If you weren't already convinced that imperfect produce is just as beautiful as conventional - this account is sure to bring the message home. Prepare to be amazed! APRIL, 2017 foodrepublic.com featured us in their online magazine. "Food expert and entrepreneur Sarah Phillips is the person behind the OG @food Instagram account (and the @UglyProduceIsBeautiful Instagram account), jumping early on the photo-sharing platform in 2011. Since then, Instagram has become a hotbed for glamour shots of perfectly styled food; oozy, drippy egg yolks; and rainbow-colored doughnuts. While managing @food and @baking, Phillips has taken it upon herself to prove that “ugly produce” deserves to be in front of the camera just as much as that tricked-out taco. Phillips takes the concept of highly stylized food and applies it to bruised and wonky-shaped fruits and vegetables, creating gorgeous stills that’ll make you rethink your rejection of that bruised apple. Here, Phillips explains her mission." APRIL/MAY/JUNE, 2017 Origin Magazine featured us in their vegan print magazine. What inspires Susan Rockefeller: "Founder Sarah Phillips has taken her 30 years of experience in the food industry and is using it to educate consumers, retailers, restaurateurs, and producers on the dangers of disposing of fruits and vegetables for purely aesthetic reasons. 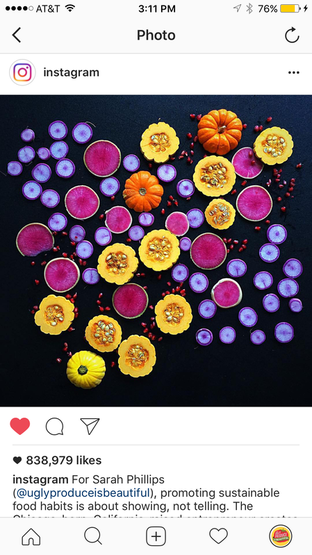 In addition to writing cookbooks, Philips is also a gifted photographer, and uses Instagram to present gorgeous photographs of Ugly Produce." Jan, 2017 @UglyProduceIsBeautiful was featured by @Instagramru (Instagram Russia) to its 9.4 Million followers on January 12, 2017. They pick Instagrammers they feel exemplify something unique, extraordinary, creative, or a stand-out from the crowd. We were honored. Jan, 2017 Sarah Phillips Talks Food Waste and Why Ugly Produce is Beautiful, Article in Grace Communications Ecocentric Blog, December 22, 2016. ​GRACE Communications Foundation develops innovative strategies to increase public awareness of the critical environmental and public health issues created by our current industrial food system, and to advocate for more sustainable alternatives. ​By building partnerships and mobilizing philanthropic resources, we promote consumer actions and public policies that support sustainable food production and embrace the complex interconnections of food, water and energy. ​Dec, 2016 Musings Q&A series by Susan Rockefeller interviews people who lead by example, waking us up to our own potential to make the world a more balanced place. We were featured. ​Beauty is in the eye of the beholder, the adage goes, and Sarah Phillips is living proof. 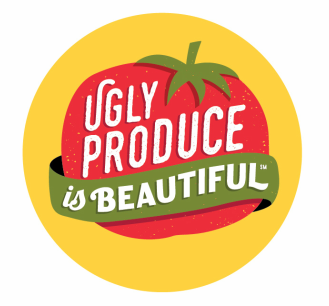 Outraged to learn that every year nearly six billion pounds of perfectly nutritious food is tossed in the American waste stream because it’s deemed “ugly” or aesthetically deformed (as opposed to spoiled, moldy, or inedible by the USDA, Philips founded Ugly Produce is Beautiful ℠ Educational Campaign. Already a well-established presence in the food world, Philips’ goal is to encourage the consumer to buy and consume those crooked, long-necked, wonky fruits and vegetables with more inclusive eyes. Not only will including some ugly produce in your diet lessen the load on our landfills (and, hence, the outgassing of methane), but will help the planet, and feed more people. "Americans are throwing out the equivalent of $165 billion each year from farm to fork. That's a huge chunk of change! Ugly produce is celebrated in all its vibrant colors and beautiful formations in this account. If you weren't already convinced that imperfect produce is just as beautiful as conventional - this account is sure to bring the message home. Provided photograph for Prairie Schooner homepage website for Winter, 2016. @UglyProduceIsBeautiful was featured by @NigellaLawson to her almost 890k followers on December 14, 2016, as #followoftheday! ​Nigella Lawson is a popular celebrity chef who resides in London, England. @UglyProduceIsBeautiful was featured by @Instagram to its 2oo Million followers on November 27, 2016. They pick Instagrammers they feel exemplify something unique, extraordinary, creative, or a stand-out from the crowd. We were honored. "...photographer and food expert Sarah Phillips founded Ugly Produce Is Beautiful to raise awareness on (and fight back against) the world’s wasteful ways when it comes to food waste." 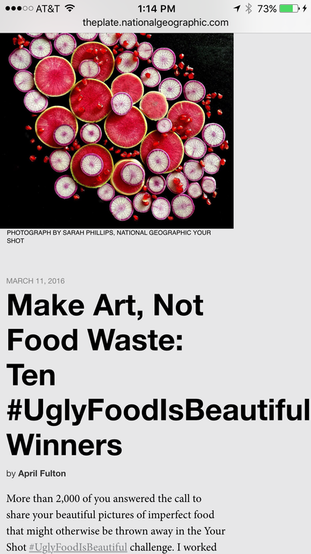 Sarah Phillips was one of ten photography winners for the National Geographic "Make Art, Not Food Waste: Ten #UglyFoodIsBeautiful Winners', chosen on March 11, 2016. There were more than 2,000 entires. Becky Harlan, one of editors and the judges, Nat Geo: "Under the art direction of Sarah Phillips, these so-called “ugly radishes” look like the belong on the wall at the Museum of Modern art to me. Sliced, diced, and expertly arranged, her ugly food collages perfectly play with shape, color, and design..."